Good Friday was a day when several of us were free to organise a longer row. Originally we’d planned to try this on the Forth after the regular Friday session, but after cancellation after cancellation in Portobello due to bad weather and a forecast that didn’t look hopeful we changed tack, decided to be more adventurous and head inland somewhere completely new. Rowporty has always engendered the spirit of adventure, and it was brilliant to again be thinking about where we could take the boat for a fantastic day out. An hour or so on the Forth is great, but as we all know there are so many more places to explore. Initially we had planned to try Loch Tay, but then switched (thanks to Maddy’s research skills) to Loch Lomond as the sun was meant to shine for longer there and launching looked really straightforward. This meant heading off early, so we first needed to check with those who had signed up for the regular Friday morning session, to make sure they felt alright about potentially missing an hour on the water in Portobello. Many thanks to all those who expressed their support and enthusiasm for our boat to try something new. After fixing a light on the blue trailer (it still needs a mudguard re-attached but we didn’t have the right equipment to do that and were comfortable that it was roadworthy) we loaded the boat on Thursday evening and on Friday morning were at the yard by 7.30am to hitch-up and set off for Loch Lomond. Apart from the oars, lifejackets and cushions we also took a VHF, a laminated map of the loch, GPS, bailers, fenders, the launching trolleys and spare rope. There is a spare tyre for the trailer already lashed on. 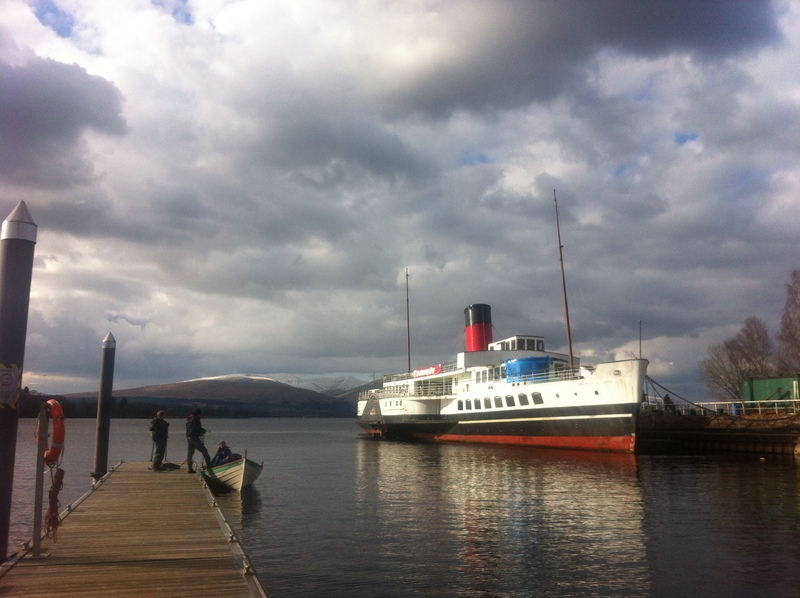 Balloch is at the southern end of Loch Lomond and is 70-80 miles from Portobello (depending on which route you take). On the way there we drove through Glasgow on the M8, then took the A814 through Clydebank and Dumbarton and onto the A82 up to Balloch. On approach to Balloch, if you turn right at the roundabout onto the A811 at Balloch, left onto Old Luss Road, straight through the roundabout onto Ben Lomond Way you just need to look for the ‘Maid of the Loch’ paddle steamer, and access to the water from there couldn’t be easier – there is secure parking, a jetty and concrete slipway. 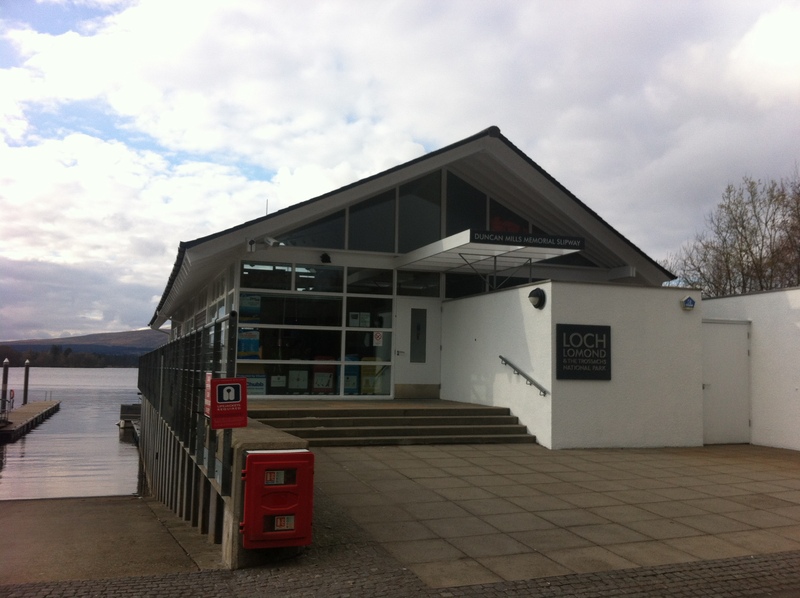 The building next to the jetty is the headquarters of the water-borne ranger service where you register your use of the Loch, leave a contact phone number and can use very nice toilets! It is free to launch with the trolleys, you only pay if you use a vehicle. It was very quiet when we were there, probably on a warmer weekend it would be busier. Once on the water (all with perfectly dry feet and legs thanks to the jetty) we headed into the wind (which was coming down the Loch from the NE) and travelled to the west side of the largest island (Inchmurrin). 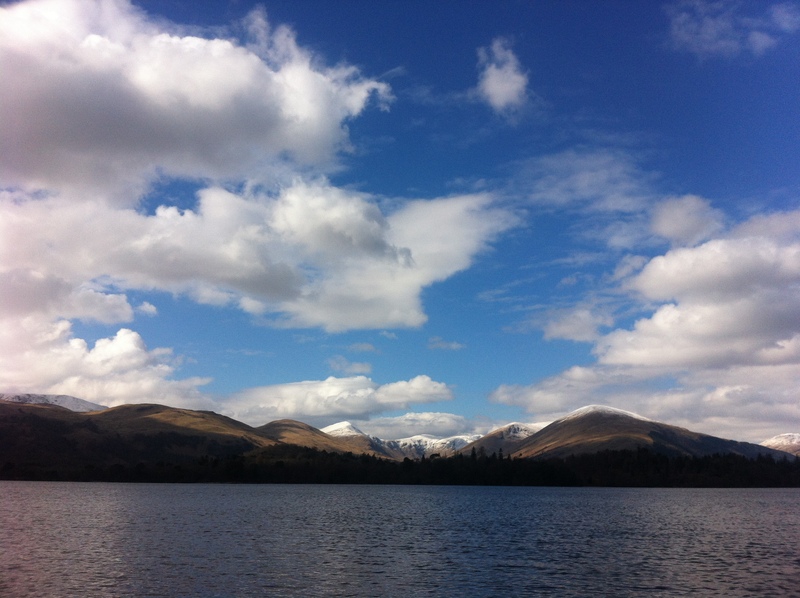 Once out into the widest part of the loch (~4 miles across) the views were truly stunning – huge snow-capped peaks all around in the distance, including Ben Lomond to the north. 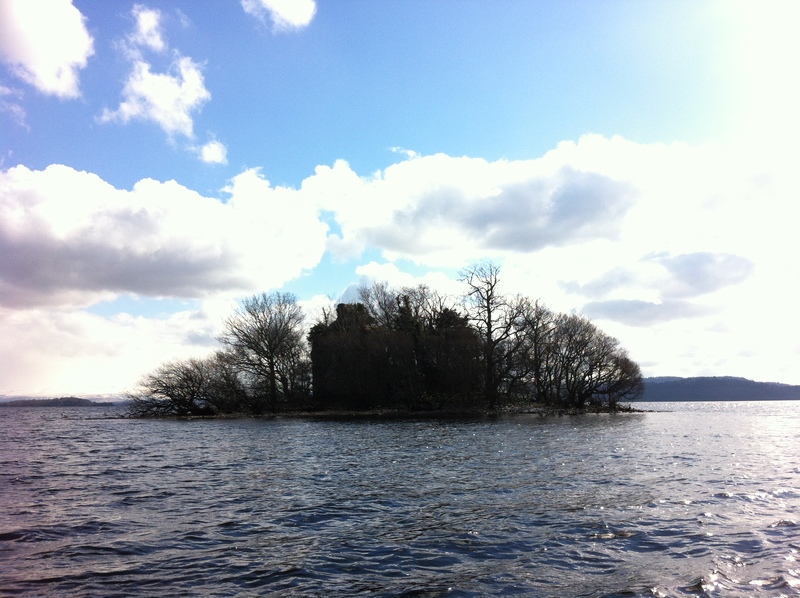 We rowed past one tiny island (Inchgalbraith) which has the remains of a 15th century castle hidden amongst the trees. We then passed through this gorgeous and very sheltered little strait between Inchtavannach to the west, and Inchmoan & Inchhconnachan to the east. 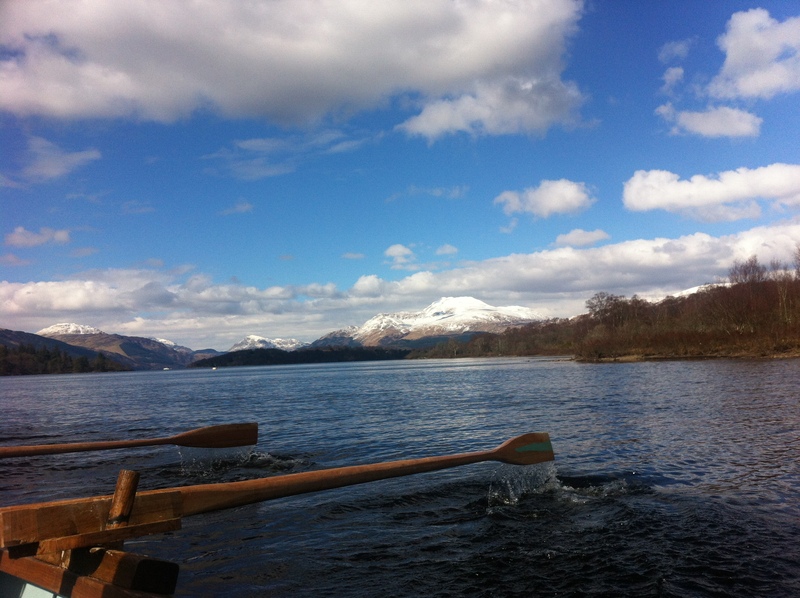 After 2 or 3 hours of fairly steady rowing, taking turns to rest, cox or change rowing position every half an hour or so, we reached Luss (on the west bank), which is about 7 miles north of our launch, and then headed back towards the east side of Inchmurran. 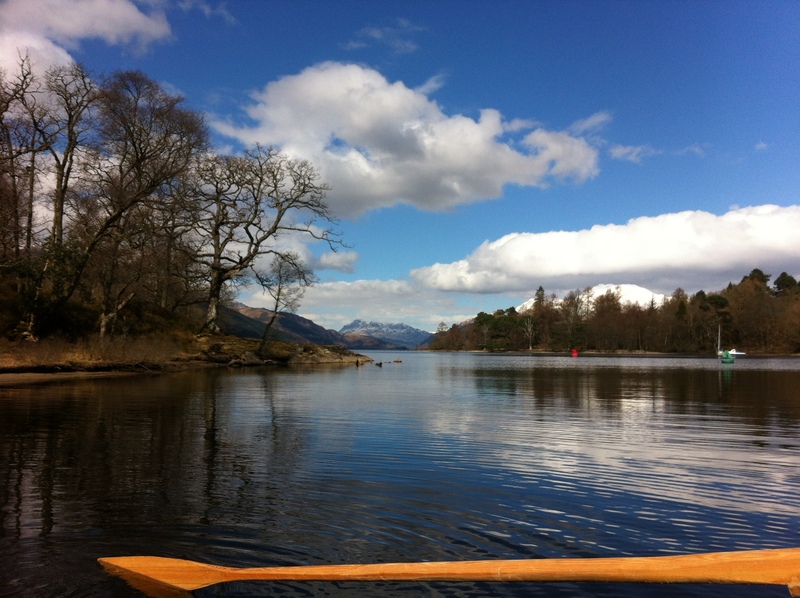 We rowed into a bit more chop on the next stage, however, we were spurred on as another advantage of Loch Lomond is that Inchmurrin is an inhabited island with a hotel/bar on the south east side serving hot food and drinks. (Open every day except Tuesday). Conveniently there is another jetty right below the hotel at which we moored before relaxing next to a wood-burning stove for lunch. There are of course more toilets here too. Having launched just after 10am we returned to the Balloch slipway just after 4pm to put the boat back on the trailer, tie her down and drive back to Porty. On the return journey we tried a different route going south over the Erskine bridge (A898 > M898) then onto the M8 back towards Glasgow which meant we were on motorway most of the way – this made it a bit quicker (although longer by distance) and more straightforward with the trailer so would recommend this route (link below). This trip is well worth repeating. We saw ducks, swans, goats and sheep but there is a huge range of wildlife worth looking out for including capercaillie, osprey, deer, otter and wallabies (yes, really!). The loch stretches another 15 miles or so further north of where we reached (although much narrower up there), and it has dozens of islands some with sandy beaches, ancient trees, historic sites and narrow creeks to explore on a longer warmer day. Other water users we saw included a canoeist with his dog, a water plane, a group of kayakers and a couple of jetskis but the space is vast and the amount of open water was exhilarating. Patsy has a copy of the map we used and any of us would be very happy to answer questions if other folk would like to try it. 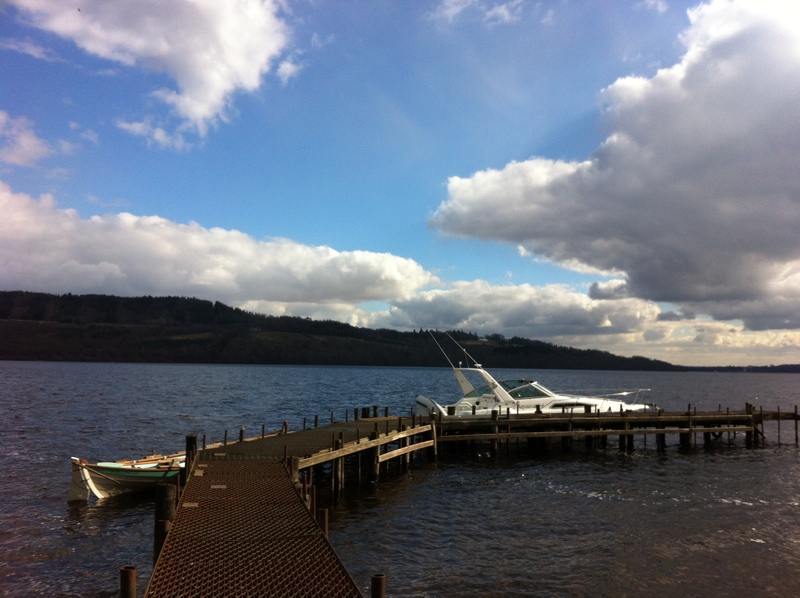 It would be great to try taking both boats one day when the weather is a bit warmer. Certainly I’d be happy to lead a return trip for others to enjoy a fantastic day out. Sally, Roisin, Maddy, Claire, Nick J, Dan.